It has been five years since every year this day of April 15, was decreed to be celebrated as Africa’s Independence Day. This day is celebrated throughout Africa. It reminds Us of the struggles for independence during the last twelve months and of our African brothers that are still engaged in the fight for freedom. For several years in the past, as must be remembered, a large part of the African continent was under colonial rule. In the course of that time, colonialists have stripped the Africans of their freedom and natural rights, and used their resources for the benefit and prosperity of their own country. Even today, colonial masters speak ill of Africans by exaggerating their poverty in the press. Africans are also blamed for the aid they receive. This aid cannot fill the needs of their peoples overnight. From under such humiliation, Africans rose up to safeguard their right and started to struggle to obtain their independence. This struggle began to bear fruit after World War II. 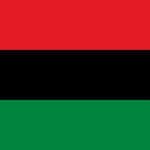 The first African Independent States Conference was held in Africa in 1958. The independent states at that time were only eight. Nevertheless, the freedom fight in Africa continued with more vigour and fervour and today the number of independent states has reached 32. This is four times the size of those independent countries which participated in the Accra Conference. Last year alone Rwanda, Burundi, Uganda, and Algeria achieved their independence and became members of the Independent African states. Although it had been duly extended at the appropriate time, we will again venture to express our congratulations to these friendly countries. In our neighbour country, Kenya, a new political trend is taking shape and elections are expected to be held soon. It is our earnest wish that Kenya achieves independence immediately after the conclusion of a successful election. That Kenya obtains her independence without the dismemberment of her regions is the policy that Ethiopia strongly supports. Ethiopia opposes all those who try to dismember Kenya under the claim of tribalism. Congo has been in turmoil after independence. It has been gratifying to Us to see Katanga reintegrated last year into the central government to form a united Congo Republic. 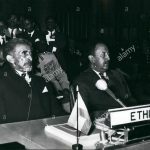 We are especially pleased, because Ethiopia has sent her troops to Congo in the name of the United Nations and made substantial contribution to the unity of that country. In Central Africa too, political movement is quite encouraging. Under the eminent leadership of Dr. Kamuza Banda, Nyasaland achieved local government under its nationals and the day of her independence is anxiously being awaited in the very near future. It has also been made clear in a recent London Conference that Northern Rhodesia has secured its right of secession from the colonialist-run Federation, and it is fast marching towards independence. Meanwhile, the fate of Africans in Southern Rhodesia is in a precarious situation. 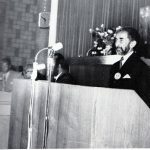 Many Africans and their leaders are found arbitrarily imprisoned and consequently, the country is in chaos, We will not hesitate to remind the British Government to make use of its responsibility to hand over authority to the African majority so that Southern Rhodesia will also be independent. 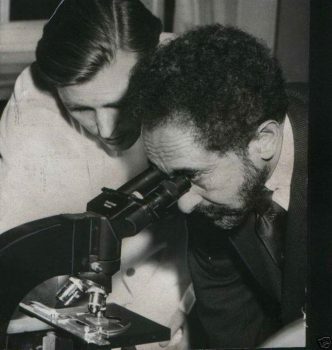 Until now the British Government has shown wisdom and sound judgment in providing independence for Africans, in a manner constructive and objective. The South African racial government apartheid policy has deteriorated instead of effecting leniency and improvement. A large number of Africans, fighting for their freedom, are from day-to-day hauled into jails without due process of law, and are made to suffer under severe conditions. Defying world opinion, breaking international laws and disrespecting the United Nations Charter, the South African government continues practicing its atrocious and odious policy. Nevertheless, Ethiopia will not deny assistance to our brother Africans who live in that unfortunate country. We shall not pass without expressing our regret to the Portuguese Government, that the fate of Africans in its colonies has not been up to now improved so as to have prepared them for independence. What We would again remind the Portuguese Government, is to prepare Africans in its colonial territories for self-government in order to curtail heavy blood-shed. 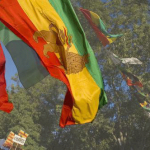 Ethiopia will not refrain from endeavouring to assist in finding solutions by which Africans under Portuguese colonies will obtain independence. 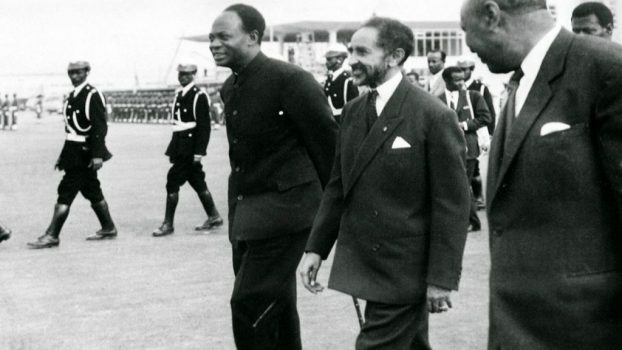 In general, We extend our good will greetings to all our African brethren who are still under the yoke of foreign rule, and wish that their struggle for freedom will bear fruit so that they would be masters of their own fate. Our help will also reach them. 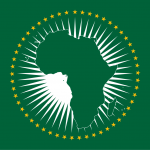 Finally, We would like to speak about the May Conference of African Heads of State to be held here in Addis Ababa. All the 32 heads of state in the entire continent have accepted our invitation and expressed their willingness to participate in the Conference. We are specially pleased by the response and co-operation shown by our neighbour sister, Somalia, for her reconsideration to take part in the conference following our recommendation and advice. The purpose of this conference is to strengthen African unity. 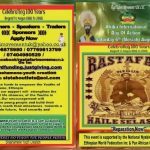 Since Ethiopia’s hospitality is historically known, it is the voluntary duty of every individual Ethiopian to extend the usual courtesies to our distinguished guests who will come for the conference. We entrust, therefore, to you all that each one of you extend the best reception to our honourable guests. Let Almighty God help us in the fulfillment of our wishes.